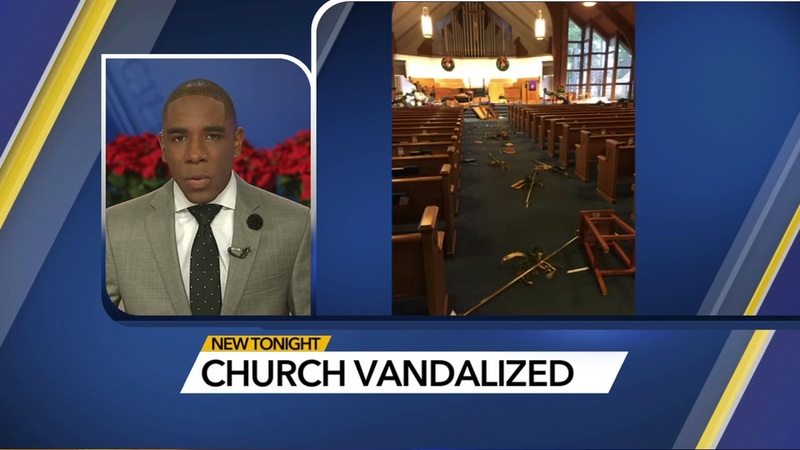 RALEIGH, N.C. (WTVD) -- Just days before Christmas, vandals left their mark at St. Andrew's Presbyterian Church in Raleigh. A Raleigh church was broken into and trashed just days before Christmas. "We were shaken. We were rocked," said Pastor Tom Harris. "This is sort of the story of the Grinch and how the Grinch tried to steal Christmas and the Grinch's heart grew three sizes but what I've seen here is that our heart has grown three sizes," Harris added. "It was very upsetting. It felt like a home invasion because this is our church home," said member Nancy Dye. Earlier this year, just before Easter, vandals struck the Historic Massey's Chapel in Durham. As Massey's did--this congregation worked. 35 worked Friday night to clean up the unnecessary mess left behind. "People were here and they were cleaning up and putting pieces back together and it really did feel like we were healing the church, fixing the church but also mending our hearts", said Raleigh mayor and church member Nancy McFarlane. "I'm less worried about holding them responsible and more worried about reconciling and helping to heal what that hurt is that would cause someone to want to that to such a place... we'd love to love on them and show them God's love," Pastor Harris said.